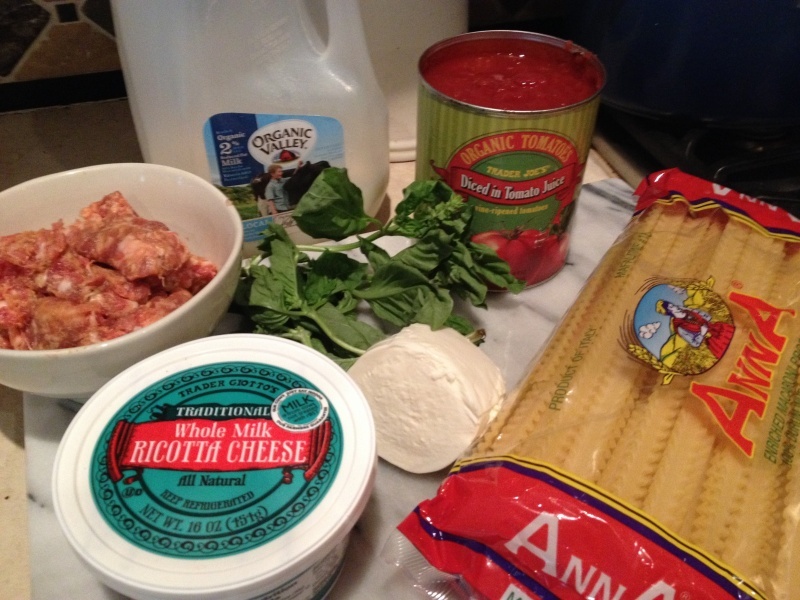 There are many ways to make lasagna. By far my new favorite is made with Malfadine (or maflade) noodles and it isn’t layered. This recipe makes lasagne doable on a weeknight. Mafladine isn’t easy to find so I ordered mine on Amazon. These short malfindi pictured would be perfect but I have yet to find them so for now I just break the longer noddles. This recipe is a hybrid of a recipe found in Cook’s Illustrated Cover and Bake and a recipe from the Kitch’n, a favorite Flavorista site for cooking inspirations. This recipe combines procedures and ingredients from both. The sausage gives this dish its “lasgana-like” flavor and differentiates it from my other easy one pot dinner –Italian Wonder Pot. Preheat the oven to 400 degrees. All the rest of the steps will be finished by the time your oven is hot. Heat about 2 Tbsp. olive oil in a dutch oven. Add the sausage and break up with a spatula. Place the broken Malfade pasta on top followed by the can of diced tomatoes. 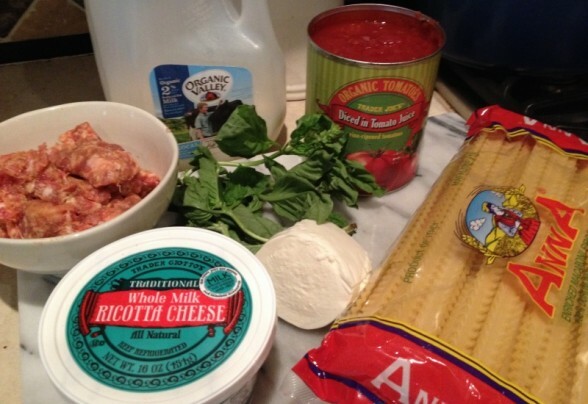 Pour in the milk and water and then sprinkle the garlic and chopped basil on top. Add a nice dash of salt and a few good grinds of black pepper. Stir it all together. Place a piece of aluminum on top of the dutch oven and then place the lid on top. Place in the oven for 35 minutes. Remove from the oven and take off the top and foil. Give it a good stir and now add spoonfuls (or scoops from a small ice cream scooper) of ricotta cheese into different areas and then sprinkle the mozzarella (or provolone or one of those bags of mixed Italian shredded cheeses). Place back in the oven, covered with just the lid for another 10 minutes. Remove from the oven and allow to cool for a few minutes (this would be a good time to either throw together a salad or steam some broccoli). Enjoy!